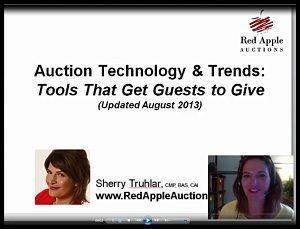 About four years ago, silent auction electronic bidding devices hit land in the USA. It’s been a race for promotion ever since. Nearly once a month I entertain a phone call from a new vendor, eager to show me his new state-of-the-art service. Interestingly, the technology was pioneered by European companies.1 Event-services company IML was the first to actively promote its offering to US-based charities. It didn’t take long before their competition followed suit. With the US charity auction market so large … and the European charity auction market so saturated … BidTech, iBidEvents, and Bid-Smart (which has since bought a US text-bid company and rebranded to GiveSmart), all jumped the pond. Thanks to the gold in its vaults, Bidpal has been able to dominate in marketing, hiring an enviable number of hungry sales representatives that most start-ups simply can’t afford. But of course, big doesn’t always mean better. What you really want is the best solution for your needs. Here’s the good news: With so many vendors to choose from — and many offering compelling services — it’s easy to find the perfect e-solution priced to your budget AND functional for your needs. Technology changes quickly (vendors go in and out of business…) but below is a partial list of electronic bidding, text pledging, and mobile bidding vendors selling in the USA right now. I’ve connected with many of these vendors, somewhere along the line. And of course, a growing number of traditional software vendors have upgraded their offerings, either via partnerships or through in-house development, to offer e-bidding in some form or fashion. E.G. AES, AuctionStar, MaestroSoft, GreaterGiving, and others. UPDATE SEPTEMBER 17, 2013: In the comments below, I was reminded that some ONLINE auction vendors (not just traditional software vendors) have also embraced mobile bidding, adapting their technology to accommodate the feature. Thanks to Jim at BenefitEvents for reminding me of the oversight. Did I miss anyone? If so, I suspect they’ll make a point of listing themselves in the comments section below. P.S. Feeling overwhelmed by the looong list? Here are two ideas to help your sanity. Second, for more more personalized help deciding which is the BEST vendor for you, schedule a consultation. I’ve helped many nonprofits figure out their technology needs .. and not just for a mobile bidding vendor. P.P.S. Have you worked with any of these companies? How did they work for you? Post your comments below. After speaking with a number of Brits who have participated in both USA and European charity auctions, I’ve gotten the impression that European gala auctions aren’t nearly as lively (read: fun) as American ones. One sales rep told me that in her next job, she was thinking of returning to Europe to become an auctioneer. “But I’d be like an American benefit auctioneer,” she said, to paraphrase “I’d have fun activities, and be clever on stage, and do things like they do here.” This leads me to believe that if the European galas are yawners, it’s no wonder that mobile bidding launched there. The technology represented a diversion for the crowd … something ‘new’ and interactive. Text pledging is different than mobile bidding, but as a number of mobile bidding vendors offer text pledging, I’m grouping it together in this post. Sherry – Thanks for mentioning BidPal today! We are so happy to help pave the path in auction automation solutions. We agree it’s important to choose the right solution for the non-profit. As we continue to research and provide new and innovative solutions, we now offer several delivery choices for organizations to choose from whether it be all cellular, our own private WIFI or a mix of the two. We are proud of our client partnerships and look forward to our continued teaming in making the most out of fundraising and operation efficiencies through the award-winning BidPal technology. Best wishes. Thanks for stopping by the blog, Karrie. As it turns out, I’m here in Chicago attending a seminar, and two of the sponsors are Bidpal and AuctionsByCellular. Just wrapped up talking to representatives from both! 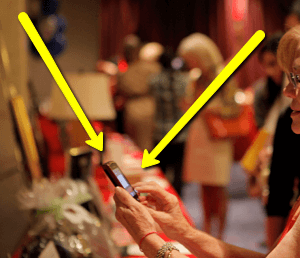 BenefitEvents pioneered mobile bidding in 2004 and now the technology has caught up with us. Our mobile application is based on our online platform, which has provided robust online charity auction services since 1998. Jim, thanks for the post. I was remiss in that I didn’t mention that online auction vendors may also be adapting their technology to allow for mobile bidding. I mentioned the more traditional software vendors who were embracing it, but I neglected to mention the online auction vendors. I’ve corrected that in the post above and thank you for drawing attention to the oversight! Thank you for the mention of Mobile Giving! We are proud to offer a solution that does not require your guests to text back and forth … very state of the art. Our all-in-one solution provides fantastic sponsorship strategies and procurement strategies for the Charity. A socially responsible green solution where you can bid using just one hand from your own phone….. and ‘sip wine’ with the other. Thanks for weighing in, Pam! I agree that the sponsorship element is a useful tool in an auction planner’s “bag of tricks.” When you’re seeking new ways to grow sponsorship revenue, that’s a great tool. Thank you for sharing all these helpful points. I’m not part of an organization; but I have attended many events with some of these vendors. The one group that stands out to me the most is, QTego Auction Technology – I have seen them at a few events, and their customer service is second to none! Great people! Thanks for weighing in, Jonathan! Everyone seems to have their preference in vendors and approaches, that’s for sure. we used bid pal last year for our auction and though we did not see a huge gain on the silent auction section we did get almost double in our Fund The Need with the electric units. so we might be the exception to the fund decrease on the hand held. This was our first year using the hand held units. Nice to hear you had a good experience, Gale. I think many groups are evaluating whether the result (gain or not) justifies the investment, and then making their next decision. Greater Giving has been working with several of the Mobile Bidding partners for years – BidPal, ABC, Qtego, Sophist, Give-Smart, BiddingForGood, ClickBid. All of these companies are able to take data to and from our event planning software so that orgs can generate one receipt and track everything in a central database. In addition we added our own Mobile Bidding 2 years ago because clients wanted one company to call night of event, something simple enough they could run themselves or choose to have support at their event. Accelevents is another alternative targeting smaller events. Our services start at just $49 for text-messaged based bidding for Silent Auctions and Raffles including credit card processing. Jonathan, thanks for sharing. Clearly there are many options for nonprofits; it’s a competitive market. Great thoughts, Jen. I’d recommend visiting with your auctioneer about it if you’re seriously considering switching to using the technology. There are positives and negatives of mobile bidding. I know that I’ve got definite recommendations on how / when / where to use it, depending on my client’s auction. If you’re working with an auctioneer, I suspect he/she will have some opinions for you, based on your unique event. Regarding the wi-fi … each vendor has a bit different set-up, so those tech needs will vary by the tool selected. Good luck!